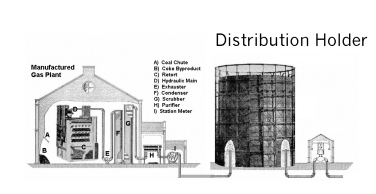 Manufactured gas plants (MGPs) had their roots in the 1700's with the discovery that a process of heating coal would produce a gas that could be used for illumination. Long before the introduction of electricity, streets, homes and businesses were lit with this manufactured gas, which became known as gaslight. Gaslight was produced in manufactured gas plants (MGPs), also known as gasworks. The first MGP in the United States opened in Baltimore in 1816. By the mid-19th century, gaslight had become so popular that most American communities larger than a village had their own gasworks. The industrialized states of the Northeast had the highest concentration of MGPs. Manufacturing coal gas was labor intensive process. While the original focus of the manufactured gas industry was to supply small amounts of gas for street lighting systems, this changed with rapid growth of the mid-1800s. In the 1870's, a new technology emerged that produced gas from oil and water, called the "carburetted water gas" process. Carburetted water gas had the potential to burn more efficiently than coal gas, which meant that it could be used for heating as well as lighting. By the "gaslight era" of the l880s and 1890s, this new manufactured gas was being piped into homes and businesses, and was widely used for lighting, heating and cooking. Existing MGPs were converted or expanded to make room for the newer manufactured gas technology. The decline of the manufactured gas industry began in the 1930's, when The Great Depression brought many industries to a grinding halt, drastically reducing the demand for manufactured gas. But the ultimate demise of manufactured gas came with the discovery and growth of natural gas, a more convenient and economical source of energy. As the pipeline capacity of natural gas grew, MGPs were either demolished or converted for other uses. Most MGPs in New York State had closed by the1950s, but a few remained on standby status in areas where pipelines could not meet peak demand. The Bay Shore former MGP was the last to cease operations in New York State. In 1989, a site investigation at a former MGP, conducted by the United States Environmental Protection Agency, indicated the presence of contaminants associated with past operations. Subsequent investigations, from 1992 to 2002, have comprehensively identified and characterized these environmental impacts. Two major types of waste materials are present at many MGP sites: coal tars and purifier waste. Coal tars are reddish brown, oily liquids which do not readily dissolve in water. Materials like these are commonly referred to as a non-aqueous phase liquid, or NAPL. Purifier waste is a mixture of wood chips and iron filings which was used to remove sulfur and other compounds from the manufactured gas before the gas was distributed to the public. Purifier waste, which was no longer capable of removing the impurities, was often disposed of on-site. The main categories of contaminants found in coal tar and purifier waste are volatile organic compounds and semi-volatile organic compounds. The main volatile organic compound of concern in soil and groundwater is benzene. Specific semi-volatile organic compounds of concern in soil and groundwater are polycyclic aromatic hydrocarbons, referred to as PAHs. These are the compounds that make up tars and asphalt. First, workers shoveled coal into large, air-tight ovens. As the coal heated, it gave off a gas consisting of methane, hydrogen and carbon dioxide; this gas was taken away by the exhauster and pushed into the condenser. In the condenser, the gas passed through tubes and was cooled by surrounding water. As it cooled, tar and oil by-products became liquid and flowed out the bottom of the condenser through water-sealed pipes into a tar storage tank. From the condenser, the gas went to the scrubber, where ammonia was removed and routed through a water-sealed drain to an ammonia storage tank. The purified gas then passed through the station meter, where its volume was measured before it was stored. Read more about MGP waste materials and their associated contaminants. Read more information about the operation of MGPs on the NYSDEC website.